The first few months of Henry V’s reign gave little indication that any radical change in the appreciation of naval power was in the offing. The clerk of the king’s ships for the period March to June 1413, one William Loveney, stated in his accounts that he had neither received nor spent any money. The eight ships for which he was notionally responsible were not very impressive; three were very small balingers of between 24 and 30 tuns capacity and the remaining five, single masted cogships of between 220 (the Cog John) and 80 tuns. These might have played a useful role as transports but would have done little to stiffen a fighting squadron. From the date of Catton’s appointment, however, the number of ships in royal ownership began to rise; the first of Henry V’s great ships, the Trinity Royal, a vessel of 540 tuns, was built at Greenwich and others were acquired by purchase or as prizes. Seven royal ships were among the enormous fleet, said to be over 1500 strong, which carried the English forces to France in the summer of 1415. After the great success of the Agincourt campaign, the tempo increased even more with large sums being spent on the royal ships both in repairs and in building new ships. Between 1416–19, 36 ships of various kinds were in the possession of the Crown, some for relatively short periods, and over £12,000 were received both from the Exchequer and from other sources for their maintenance. The building programme undertaken by both Catton (at Winchelsea and Small Hythe) and Soper and his associates (at Southampton) was notable not only for its extensive nature and cost but because at least some of the vessels concerned were more truly warships than any others built previously for the Crown in England. This applies most forcefully to the ‘king’s Great Ships’, the Trinity Royal, the Holighost de la Tour, the Jesus and the Gracedieu. These were not only considerably larger than all other ships in royal possession with the exception of carracks taken in action from the Genoese but had also more advanced rigging and more fearsome armament. The Gracedieu was three-masted and at 1400 tuns by far the largest vessel afloat in northern waters. She carried cannon and iron darts for hurling from her topcastles as did her sister ships which were two masted. There was a clear strategic purpose in the building and arming of these ships. They were intended to counter the might of the Genoese carracks hired by the French to pursue the war at sea and make plain the extent to which northern rulers had turned away from employing galleys for warlike purposes. To some extent English victories in the Channel from 1416–19 might seem to demonstrate the success of this policy although, as we shall see, smaller English royal ships also played their part. It is also notable that accounts of these sea fights are found not only in English chronicles as might be expected but, often in greater detail, in Venetian and Genoese ones as well. Events in the Channel were now of interest much further afield. The first encounter occurred off Harfleur on 15 August 1416. This port of entry had been taken by Henry V the previous year but was now under siege with the garrison suffering badly from lack of supplies and much reduced by disease. The Duke of Bedford was put in command of a relieving fleet of some 300 vessels which included the Holyghost de la Tour and four other royal ships. This fleet faced considerable initial difficulties in assembling all its forces. The writer of the Gesta Henrici Quinti describes how one squadron, assembled off the Camber, was faced with contrary winds, in the end relying on a favourable tide to round Beachy Head and join the squadron from Southampton. No fewer than eight Genoese carracks in the pay of the French were assisting in the investment of the town. A force of 12 galleys, commanded by Gioanni de’ Grimaldi had also been hired by the French but had withdrawn after the death of Grimaldi in an attack on an English convoy of wine ships sailing for Bordeaux. It is not clear what other vessels were involved on the French side. It seems that a Spanish squadron fled when it saw the size of the English fleet while French vessels seem to have remained in harbour at Honfleur, taking no part in the action. This went on during daylight hours and ended with three carracks taken by the English, one driven aground and wrecked and the remainder put to flight. A German hulk was also sunk. Antonio Morosini, a Venetian chronicler, whose account is the most informative, gives no further details apart from the fact that the battle was very cruel with high casualties on both sides. The site of the battle, not far off shore in the sheltered mouth of the Seine, is typical, as we have seen, of this kind of encounter. It was not so usual for a force largely composed of smaller vessels to be so successful against carracks which, with their great size, large crews and high-sided hulls, could dominate a boarding action. Perhaps on this occasion good boat handling skills (enabling the English to lay their vessels alongside the enemy) and determination carried the day. It may also be the case that the smaller English craft drawing less water were able to trap the carracks against the coast on a falling tide. This is hinted at in Morosini’s account of the wreck of Zoane Spinola’s ship which ‘was wrecked because she took refuge in a place where she ran aground at low tide’. Further understanding of the realities of naval operations in the Channel can be deduced from the story of an action which took place about six weeks after the successful relief of Harfleur. A large Genoese carrack was sighted in mid Channel probably making for Sluys. A force of six English balingers set off in pursuit under the command of the Richard Beauchamp, Earl of Warwick, the Captain of Calais. Nothing was known of the outcome of the affair until one balinger came into Calais reporting that she had lost the rest of the squadron in the night. The next day a further balinger limped into port with the full story. The remaining five ships had caught up with the carrack at dawn on Friday 27 September; the decks of the carrack loomed above the balingers exposing them to a hail of missiles from her defenders. They had, however grappled with her again and again until forced to break off the engagement from lack of missiles and boarding ladders. In the end the carrack ‘made off at speed on a straight course towards Sluys’. An easterly gale had then got up further separating the English ships but by 30 September all managed to return to Calais. In the open sea the sailing ability of a balinger matched that of a carrack; indeed the smaller ships may well have had the edge for speed but a carrack had to be very greatly outnumbered and her crew almost completely disabled for her to fall victim to a boarding action on the high seas. In the next four summers, 1417–20, English naval activity in the Channel was well organised, purposeful and clearly directed at supporting the king’s campaigns on land. The French relied more or less exclusively on forces provided by Genoa and Castile. The English tactic was to send out patrolling squadrons composed of a core of royal ships and also arrested shipping. The commanders were operating under a system of indentures very similar to that used for the retinues of captains in land operations. In many ways this system was extremely successful. An impressive list of vessels was captured. The Earl of Huntingdon in 1417 took four more Genoese carracks in one three-hour engagement. His squadron included two of Henry’s ‘great ships’ the Trinity Royal and the Holyghost but otherwise was mainly the useful balingers. Other commanders in the same summer took a further five ships, at least three being Castilian and one another carrack.26 These vessels were then added to the royal fleet increasing its strength considerably. Later years saw less action as by 1418 most of the Channel coast was in English hands. Clearly, however, the possibility of a Castilian fleet allied to France reaching the Channel still worried English commanders. By 1420, the largest and newest of all Henry’s ships, the Gracedieu, was ready to put to sea under the overall command of the earl of Devon. This patrol had little strategic significance; Henry had completed the conquest of Normandy while a political change in Castile had put an end to their alliance with the French. Events when the expedition was on the point of putting to sea cast some light on the way in which these expeditions were put together, expanding on the rather terse information available in formal royal writs and commissions. A report to the Council of May 1420 explains what had happened when an attempt was made to take the muster of the crews and men-at arms and archers enrolled for the cruise. The Earl of Devon flatly refused to muster his men at all. The commissioners then went on board the Gracedieu; they were not greeted with enthusiasm. The quartermaster seized the muster roll from the ship’s clerk and threatened to throw it into the sea. The ship was now in the Solent but before it could clear the Isle of Wight, some members of the crew from Devon mutinied and insisted on being put ashore at St Helen’s on the island. The commissioners tried to intervene and for their pains were assaulted and sworn at. What was at the root of these disturbances? Were the Devon men serving reluctantly with no wish to spend most of the summer patrolling the Channel? We know the weather was bad, since the commissioners could not even get on board another ship because of the state of the sea. Did the Devon men fear that the Gracedieu was not seaworthy? A muster roll was the basis on which the members of an indentured retinue were paid; had the numbers been inflated fraudulently to increase the sums available? We cannot answer these questions but the existence of the report does make plainer the rough, often violent world of early fifteenth-century mariners. 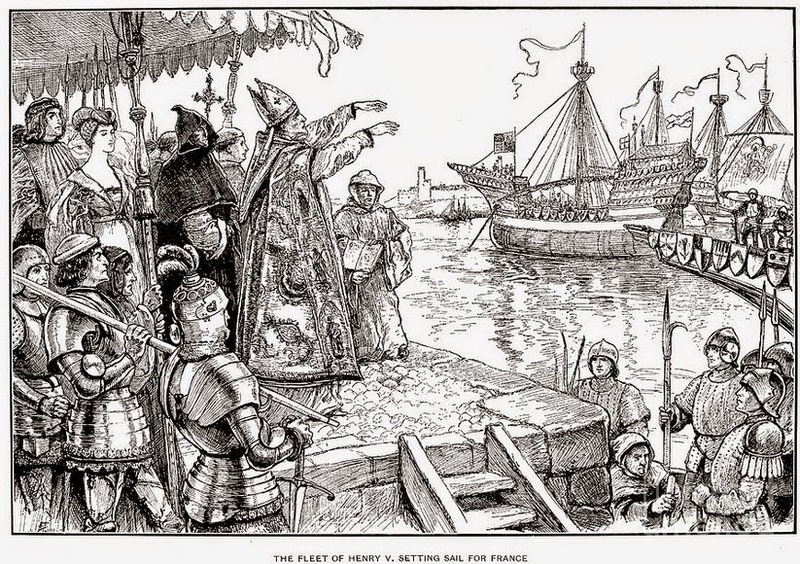 The death of Henry V and the completion of the conquest of Normandy brought to an end this period of rapid expansion in the use of royal ships by the English. As well as actions between opposing squadrons at least on occasion in the open sea this had included the support of land forces at the siege of coastal or riparian towns and the usual transport and messenger duties. The entire Channel coast was now in the hands either of the English crown or its allies, Burgundy and Brittany. Henry V’s will had treated the royal ships as his personal possessions and directed that they should be sold to pay his debts. His executors complied leaving only the four ‘great ships’ laid up, at first at anchor in the Hamble river and finally beached on the ‘woses’ and a single balinger the Petit Jesus based at Southampton. The French crown had had little or no interest in the direct ownership of ships after the destruction of the Clos des galées; by 1436 the same could be said of the English.